I would like to thank Sennheiser Canada for providing me with these headphones to review and to inform everyone that these were provided by Sennheiser for me to review. REALLY LOUD! For those of you who enjoy abusing headphone drivers these things can go to speaker-like levels fairly easily. Now after listing all that I would think that most of the people reading this right now would belong more in the "audiophile" group, those who value sound quality above all else. I can tell you right now, THESE HEADPHONES ARE NOT FOR YOU! They were not designed to compete with the headphones you would find on the "audiophile" market (ex. Shure SRH series, Grado SR80i/SR60i) these were designed more for the general public, or rather the teen market("street" brands like Skullcandy or Beats). So I'm going to answer this right away, if you can forfeit features for most accurate sound reproduction (including isolation, leakage and cable length), there are better choices. But if what you're looking for is something a little more streetwise, toned towards mainstream music and something that will survive everyday abuse, the HD419's are something you would want to consider. When it comes to review music these headphones have absolutely no synergy at all with almost anything audiophiles would consider "reference". Stuff like bluegrass jazz and classical sounds fairly distorted and odd to my ears with the HD419. Switch over to mainstream genres like rock, pop, hip-hop, and dance (to name a few) these headphones come to life. The HD419's are really laid back with lots of energy in the lower frequencies very nice for the teen who loves to go "NEEDZ MOAR BASS!!!!!!!" but without compromising much of the mids and highs. These are ultimately effected though and I do notice the mids being veiled by the bass on a few occasions. Now the biggest problems I have with these headphones are clarity and speed/separation. Overall these problems are still around but are a lot less noticeable with more mainstream genres. To me these headphones sounded a tad muddy and lacks the clarity of analytical phones in it's range like the Grado SR80i's or the Shure SRH440 but improves a decent amount over the Skullcandy competition. The sound of the HD419 goes more for enjoyment over reproduction, when I play music by people like Glenn Gould and Miles Davis distortion becomes really apparent. Switch over to more mainstream genres and I have no problems at all. Now being an analytical person who's heard a number of quality headphones I notice these flaws, but to non-audiophiles, these are solid headphones. Twin Brother's: "These sound better than my Skullcandies 0_0." Friend: "Hmm not bad *takes headphones off and turns to max volume*... Hey look! I can use them as speakers!" Basshead: "Not bad, it's got bass... but Beats are better." It has a really laid back sound signacture that never feels too aggeressive to my ears and kinda reminds me of the IE8's. The soundstage feels really pushed back and is never upfront. Anyways going a bit more in depth with the sound, the basshead has a point, these headphones have bass. These headphones have a good amount of bass, enough to satisfy a basshead. When you compare the HD419's bass level to more analytical headphones like the SR80i and the SRH440 the HD419's just blows them out of the water in terms of bass quantity, but falls behind a little in bass clarity.The packaging itself claims that these headphones have "punchy bass" and they really do have punchy bass. In general the bass gives off a muddy but impact, it lacks clarity but definitely gives off a nice BOOM. I find bass drum impact on some tracks lacking though, it tends to be aired out and lacks driving force behind it, but this is only for a few tracks though. Overall these headphones great bass response, leaving a bit to be desired in clarity but still beats most of it's competitors. When I first listened to the mids of the HD419, I was fairly happy, not drowned out by the bass and fairly clear. After a little time goes by I noticed that the mids, even though they were clear, they sounded veiled. To my ears, the HD419 sometimes sounds like a speaker with a thin piece of foam blocking it and at other times sound distant and pushed back. Though percussions in particular on these headphones are very vibrant and have a fairly strong impact. The treble's description follows the mids, laid back and a tad veiled. For those who have heard the IE 7's this is you will understand when I say the treble is clean but it sounds sharp and aggressive. This is the exact opposite, rolled off near the end and feels slightly overshadowed by the bass. The pictures can help me do the talking. When I first took these headphones out of the box, I was a tad disappointed. Being a street line headphone, I was expecting some type of storage to come with it, even if it was a little pouch. But after using them for a month or so I want to totally disregard this point as there is just no need for any accessories of the sort.As long as you don't run these headphones over with your car or put them through a 20 foot drop the only damage you will ever do to these headphones are minor scratches. In order to test the durability I put the headphones in my bag in front of my textbooks and laptop when I need to carry it to school. Something I usually wouldn't do if I wasn't fairly sure they would survive. The headband also can also bend like crazy, (see the picture above) so pretty much unless you deliberately try to twist and break the headband there is no way it will break. As I have already mentioned the cable was a point of interest for me because it was so thin, but it seems to be able to take a fair amount of abuse (much more then the standard iBud). When I first listened to these headphones I already knew that I had to take a different approach to review these headphones because these headphones were not designed for audiophiles so I can't say that these headphones are going to revolutionize the audiophile world because they won't, heck they will be trampled in it. But bring it into the world of iBuds and Skullcandy, you bring in a powerhouse to play with the minors. I would really consider this headphone to be more of a stepping stone to better audio as it provides iBud users with the speaker-like sound that they are accustom to while adding detail and soundstage.On top of that, the HD 419 perform better than many other street line products in its products (to my ears anyways) as it provides a more dynamic and balanced sound. Great review Sennheiser ftw i hope you get a chance to review the HD 449 soon. I currently have the HD 449 and they are going to be reviewed. Thank you for the review, it was really helpful. I and purchased these headphones off of Amazon today and they should arrive by the 31st of May 2012. I've mostly only good things about these set of headphones, nothing even close to prevent me from buying them. One small thing and I don't know how I am going to feel about is the cloth type materials used on the on ear part of the headphone. If you could tell me how that material feels compared to the "Pleather" materials I would appreciate it! Well the material the HD419 use on their cushions is either velour or felt, I'm not sure which one it is specifically. But if I was to compare the "plastic leather" pads used on the HD449/HD429, I would say I prefer the cushions on the HD419 a bit more because they are less prone to sweat but also because they are a lot less firm and they feel like they hold to my ears a little better. If you're worried about the material irritating your ears, I don't think that would be a problem. Sorry I can't be more descriptive and please tell me how it goes! 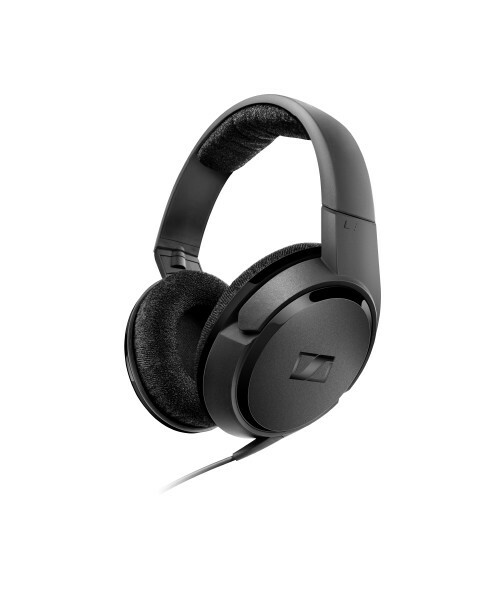 which would you prefer Sennheiser HD 205 or HD 419 for good bass? Well that depends on what you call "good bass" I find both of them have a different perception on bass. OK, first question: the HD449 is going to take a little while longer as I am busy with finals at school but it will be out within the next two weeks. As a side note, I will also be doing a HD439 review soon. Second question: My general rule is to use an amp on headphones that are 50Ω. My reason for this is: Currently I only have a vintage Yamaha CA1010 amp I believe the lowest safe impedance with it is 32Ω or 50Ω I can't find enough information to confirm it yet so why take the chance. As for the Fiio amps I have never used them, I will be able to give you a better answer around August as I plan to get a few budget amps around then as they are rather hard to obtain in my area. The only Canadian Fiio dealer is HeadphoneBar I believe and I much prefer making my purchases in person. I got a Brand New (SEALED PACK) Sennheiser HD-419 Headphones. I wanna Sell them off for 2.5K. Anyone Intrested??? Call 9867552444. My Mobile store is offering only 2K to me for this.... But I definately dont wanna sell it at the tag of 2K. HD 449 is really loud when i connect it to my PC compared when using to a mobile phone which has really weak output even at 100% volume. I need to purchase a Fiio E6 possibly. hello mate.excellent review.but i got a doubt. how does it sound with portable players? i have a sony ericsson live with walkman mobile phone.do you think it ll work good with that? please reply. Portable devices should power them fine. I generally use them with my iPhone so I don't think it will be a problem. Unfortunately, these headphones are lame at higher frequencies. I had way cheaper headphones with similiar specification, that could reproduce better highs. After all, bass in 419 HD is very nice. Its a really hard choice between the hd205 and the hd 419, i need headphones with clear sound strong bass and that they will be comfortable for a walk, what do you thing? would u recommend hd 419 or hd 429 or hd 201 for a non-audiophile interested in comfortable and durable headphones to use with mobile phone ( htc explorer ) or sony mp3? thanks. I would take either the HD 419 or the HD429 over the HD201. As for which of the two to go for, that is a matter of preference. The HD419 have more bass while the HD429 has more controlled balanced bass with more aggressive treble. In terms of build quality the HD4xx series all use similar materials so they are similar in build and are rather durable. One thing you may want to take note of though: the HD419 use valour pads vs pleather used on the HD429. Hope this helps you come to a decision! Sony MP3 Player NWZ-B172 ).....?